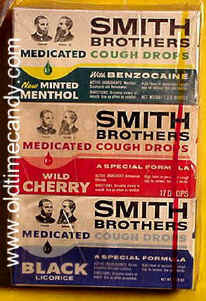 We are sad to announce that Smith Brothers Cough Drops have been discontinued by the manufacturer. Our stock has been depleted. Please consider Luden's Cough Drops or Pine Brother's Cough Drops. The Smith Brothers Cough Drop box portrays one of the world’s most famous trademarks. The two bearded gentlemen are affectionately known to generations as Trade and Mark. Not well known, however, is the fact that the Smith Brothers really existed. Their names were William (Trade) and Andrew (Mark) and they helped found Smith Brothers in Poughkeepsie, New York in 1847. William and Andrew were sons of James Smith who moved to Poughkeepsie from St. Armand, Quebec in 1847 to establish a restaurant. Though James was a fine carpenter by trade, he was an even better candy maker and a businessman. The story of the birth of the first Cough Drop is a good example. The story goes like this... a journeyman stopped at the Smith restaurant and sold James the formula for a delicious and effective cough candy. James saw a need for such a product in the cold part of the country where he lived and immediately mixed up a batch on his kitchen stove. Smith Brothers Cough Drops were a quick success and demand for the "cough candy" grew fast. Only a few years later, in 1852, the firm’s first advertisement appeared in the Poughkeepsie paper, inviting all "afflicted with hoarseness, cough or colds" to test it. Young William and Andrew were active in the new business from the start. They helped mix the family secret formula in their father’s kitchen and busily sold the product in the streets of Poughkeepsie. The two boys inherited the fast growing business on the father’s death in 1866, and the company officially became known as Smith Brothers. As sales grew their success was met with a whole flurry of imitators -"Schmitt Brothers", "Smythe Sisters" and even other "Smith Brothers" appeared with imitative product. The real Smith Brothers, by this time having long, flowing beards, decided to place their own pictures on their product packaging, which consisted of glass bowls for a counter display and small envelopes into which the shopkeeper counted the Smith Brothers Cough Drops for each sale. By chance, the word "Trade" appeared under the picture of William and the word "Mark" under that of Andrew. Thus, it happened by a mere coincidence that the famous Smith Brothers’ trademark was born and the Smith Brothers became known to generations of Americans as Trade and Mark.